The terrestrial environment is home to a vast array of snails and slugs. Many native land snails and slugs live in the moist layers of litter on the forest floor and other moist habitats such as rotting logs, under rocks or beneath debris. In eastern Australia, they are particularly diverse in rainforest areas. By contrast, fewer species occur in the dry eucalypt forests, but these dry-adapted species can have greater ranges than the rainforest species. Whereas marine snails typically use gills for breathing, land snails and slugs breathe air through a modified mantle chamber which acts like a lung. Some land snails have an operculum that seals the aperture which helps prevent water loss. In others, the shell aperture may be sealed by an epiphragm (hardened mucus) during extreme dry spells. The close association of land snails with rainforest means that they are sensitive indicators of biological change. Many species are threatened by habitat loss due to human activity and forest degradation and/or fragmentation. 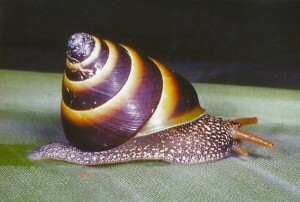 Others can constitute severe environmental pests such as the Giant African Snail which has established itself throughout the south Pacific region. Brown and Gold Treesnail (Noctepuna mayana): Cape Tribulation to Cooktown, NE Qld.